Daniel Radcliffe in Privacy, at the Public. Abstract-noun titles are usually deceptive, or at least under-determined; Doubt, Democracy, and Plenty, good plays though they are, might each just as easily have been named something else. 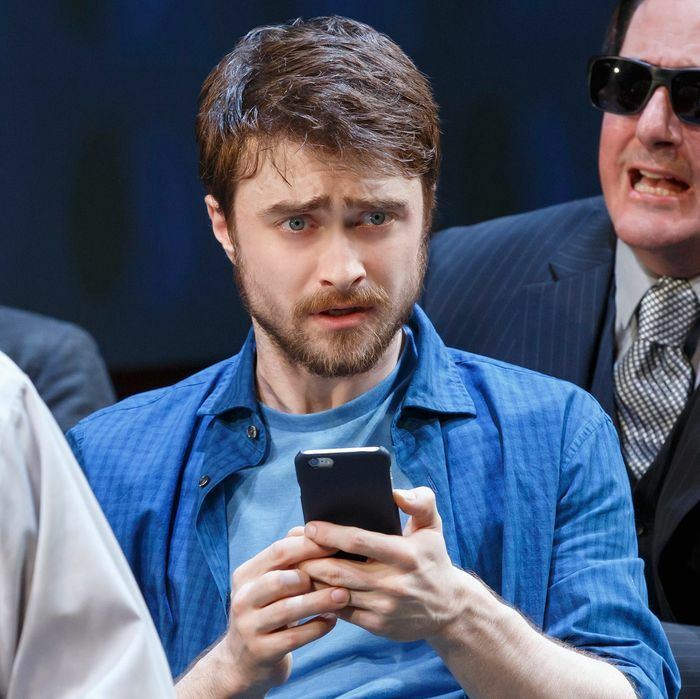 Not so for Privacy, which opens tonight at the Public in a production starring Daniel Radcliffe. It is so specifically and solely a discussion of privacy in the age of smartphones — from cookies and Uber ratings to Big Data and Edward Snowden — that it barely functions as anything else. Not that the play, written by James Graham and created by him and Josie Rourke, doesn’t try. It begins, deceptively, with the hoary dramaturgical device of a therapy session; Radcliffe’s character, known as the Writer, seeks help in recovering from the painful dissolution of a relationship. His ex, he explains reluctantly to a shrink, found him to be too withholding. (He is so protective of his inner life that he refuses at first to reveal even the partner’s gender.) But however private he may be in public, he has become almost compulsively public in private, spending his time jumping down “internet rabbit holes,” “hyperlinking through life,” and leaving, unknown to him, an invisible trail in his wake. Radcliffe, now a very confident, naturalistic comic actor, with the requisite tics and stammers in place, puts all his considerable skills into fleshing out this barely there character, who even in England probably doesn’t exist. He might have spared himself the bother, though, in a play that only wants his charm. Luckily, that too is considerable, because when the shrink suggests that the Writer use his explorations as the foundation for new work, we are suddenly whisked out of that wisp of a setup and into what amounts to a series of PowerPoint-like skits. These are variously amusing or banal; they are all unlikely. The writer moves to New York (just as the play moved here from London’s Donmar Warehouse) to interview American experts on Big Data and netiquette who then pop onstage in the form of Rachel Dratch, Reg Rogers, Michael Countryman, Raffi Barsoumian, and De’Adre Aziza. They are all delightful, but what they have to say, presented here not-quite-verbatim and in spoofy contexts, is generally quite familiar. (Did you know that people use their smartphones as a way of avoiding intimacy? But also of obtaining intimacy?) The first act focuses on the meaning of privacy in interactions we may feel we have control of: social media, email, e-commerce, dating apps. In the second act, the more involuntary implications of interconnectivity, especially data mining, psychometrics, and government surveillance, come to the fore. Here we are meant to be shocked that our smartphones are constantly recording, and often sharing, our tastes and contacts and whereabouts. I wasn’t shocked, though the saving grace of this production (directed wittily by Rourke) is that it remains entertaining even when merely massaging information most of us absorbed years ago. (The much-praised Donmar production, using different documentary material, ran in 2014.) This is largely due to meta-theatrical shenanigans that the Public has, fairly enough, asked reviewers not to spoil. You may already have heard that, contrary to most pre-show warnings, this one’s asks you to leave your phone on; at various points throughout, access to it will become relevant. There are also audience-participation opportunities. And you will quickly notice that a man referred to in the program as the “onstage digital researcher” sits at a desk tapping away on a laptop throughout. He is not playing solitaire. The production’s tech tricks lend it an atmosphere of surprise that its content sorely lacks, and also a sense of urgency that it cannot otherwise gin up. It makes no argument, dramatic or even political because, like a lot of documentary theater — I think of the Civilians especially — its point-of-view is too diffuse. (It’s also, at 2:30, too long.) When a real-world figure in the field shows up (remotely) at one point, he may elicit a gasp but does not even get to rehearse his views; he reads Shakespeare instead. It’s dull. Indeed, as the work of many contributors and entirely found materials, Privacy is the theatrical equivalent of a quilt. All it can really do is comfort the convinced. Privacy is at the Public Theater through August 14.